(CNN) - A torn black and white picture of a beautiful Buddhist stupa is itself photographed next to the actual building, in all its golden finery. Two images of the same structure taken half a century apart. It's a simple concept, but a powerful representation of a lost past and a transient present. It's one of a series of images captured by Laotian filmmaker and photographer Thanavorakit Kounthawatphinyo, known as Nin. 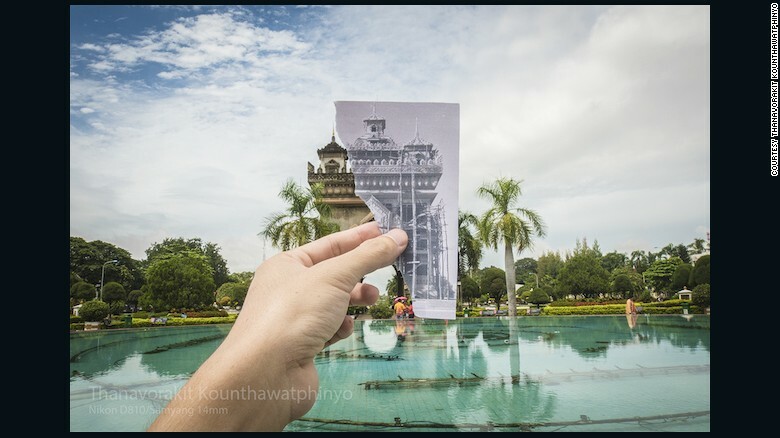 He decided to document his country's capital, Vientiane, and the changes it has undergone, in a number of photographs that show monuments from today's city alongside images of the same landmarks taken 50 to 60 years ago. 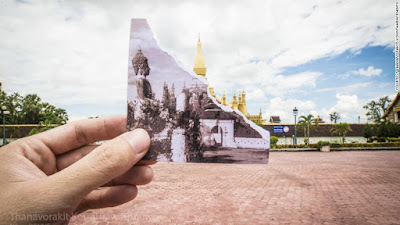 The photos show a city that is clearly recognizable from the mid 20th century, but hint at the way that Vientiane has changed since then. To read the rest of this article and amazing photos, click here to go to the source article. Apparently guys can wear pa seen too!